(mens M) Mens Ugly Xmas Sweater! SNOOPY! Red, green, GLITTERY GOLD. Super Soft! 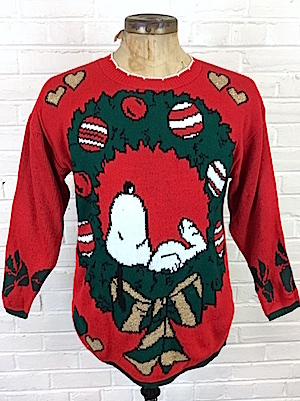 Home > Men's Vintage Shirts > Ugly Tacky Christmas Sweaters > (mens M) Mens Ugly Xmas Sweater! SNOOPY! Red, green, GLITTERY GOLD. Super Soft! Kinda cute Christmas sweater! SNOOPY! We *heart* Snoopy! Soft n' cuddly pullover sweater. Red base with a large green wreath, decorated with red and white ornaments. GLITTERY GOLD and green hearts. Large green and gold bow. And Mr. Snoopy laying down inside the wreath. Made by Snoopy & Friends. 100% acrylic.